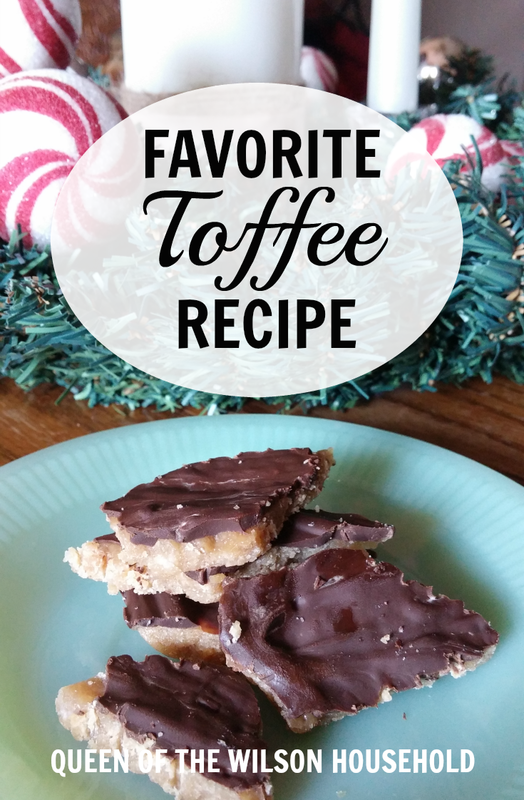 One of the candies I could always count on my grandmother making at Christmas was toffee. My mom gave me the recipe several years ago. It is super simple and absolutely delicious! 1. Butter a 9×9 baking pan. 2. If using pecans, spread them across the bottom of the pan. 3. Heat the sugar and butter on medium heat and stir constantly to combine. 4. Bring sugar and butter mixture to a boil and let boil for 7 minutes. 5. Immediately pour sugar and butter mixture over pecans. 6. Sprinkle the chocolate chips over the toffee. 7. With a knife or spatula spread the melted chocolate chips over the top of the toffee. 8. Cool in the refrigerator for an hour. 9. Take it out and break into pieces using a fork. Store in an airtight container. I like to keep mine in the refrigerator. Oh I'm so mad -the youngest ate all the chocolate chips! this sounds so good -I'll be at the store tomorrow and I can't wait to make it! Yes, go get yourself some chocolate chips!! I hope you like the toffee, Vickie. It really is easy to put together.